I’m not much of a wine drinker, but I jumped at the opportunity of visiting the fabled Wine Route in the Alsace district of France. Winding past immaculate wineyards and quaint villages and towns beautified by bright potted flowers in windowsills, the route traverses the eastern side of the Vosges mountain range. 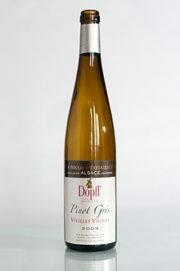 Fine wines have been made in Alsace for centuries, and connoisseurs rate them as among the best in France. At least 100 million bottles of wine are produced annually, from Sylvaner (dry and fruity) and Riesling (very dry, with a delicate bouquet) to Muscat (exceedingly fruity) to Pinot Blanc (dry and subtle). 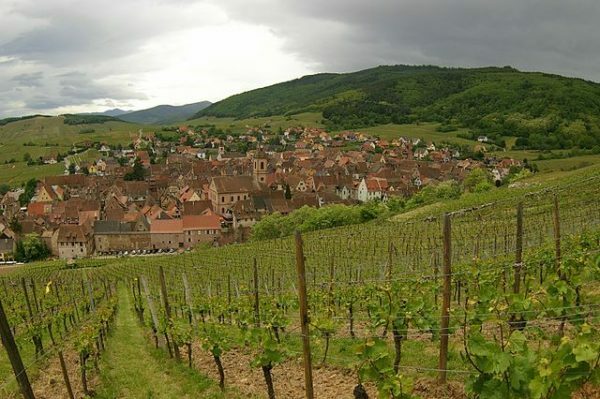 Given the importance of wine in Alsace, a visit to a winery is recommended. My family and I visited Dopff Au Moulin — the second largest winery in the region — in the walled village of Riquewihr, population 1,600. 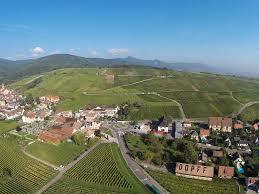 Dopff Au Moulin, founded in 1574, is a family business. Its vineyards spread across 70 hectares and surround the village in a sylvan embrace. We were taken into the cool, aromatic cellar and shown around by the marketing manager. Some of the oak vats were 100 years old. We were told that two-thirds of its wines are sold in France. 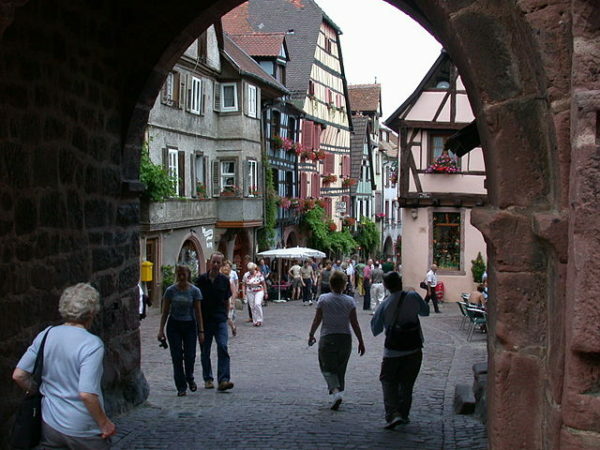 Riquewihr itself, which has lost none of its medieval charm, is well worth exploring. Its Gothic and Renaissance buildings, with their elaborate doors, wooden balconies and unusual windows, leave a strong impression. Several buildings are particularly striking — the 16th century Maison Liebrich and Maison Kiener and the 17th century Maison Preiss-Zimmer. The Tower of Thieves, close to the majestic 13th century High Gate of Dolder, was where justice was doled out to common criminals. Woodcuts of criminals being subjected to torture define this site. Three hundred meters above sea level, in the foothills of the Vosges, Riquewihr is near an unspoiled forest of chestnut and fir trees bisected by well-marked paths. Driving along the Wine Route, we stopped at four other destinations that should be explored at leisure. Obernai, with its exquisite half-timbered buildings and charming cafes, was delightful. Barr, approached in summer and early autumn through stunning sunflower fields, has an attractive market square. Bergheim, which retains the remnants of its 15th century fortifications, is home to Wistub du Sommelier, an exceedingly fine restaurant with a great menu and a long wine list. We had the pleasure of dining there one memorable evening. Haut-Koenigsbourg Castle, the biggest in Alsace, sits high up on an isolated peak. 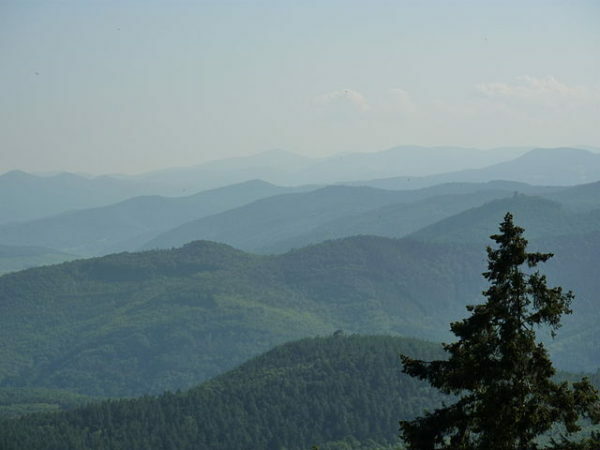 The view of the Vosges plain below is breathtaking. Alsace, a magical place, was a delight from start to finish.